Hayden Panettiere answered the door to police last month in an apparent drunk and frantic state, according to a police report obtained by TMZ on Sunday. The incident involved the 29-year-old actress's boyfriend, Brian Hickerson, 34, who reportedly had got into an altercation with his father, according to the report. The Nashville actress features in a report by Greenville City Police Department in South Carolina, after they responded to a call for assault and battery. According to the documents obtained by the celebrity website, the responding officer saw what appeared to be Hickerson chasing his father David through the house with a Gatorade bottle in his hand. The officer says Hayden rushed to open the door for him in a panic, and he immediately put Brian in cuffs to calm the situation. TMZ reports that the officer says Brian was uncooperative, refusing to give any personal info because of the potential negative impact the incident could have on Hayden. The Heroes star reportedly told the police that she and Brian's father had been drinking before the altercation. David reportedly had visible injuries on his face, severe bruising and bleeding, which he said were because he had just fallen. TMZ's sources say Hayden denies having been drunk. 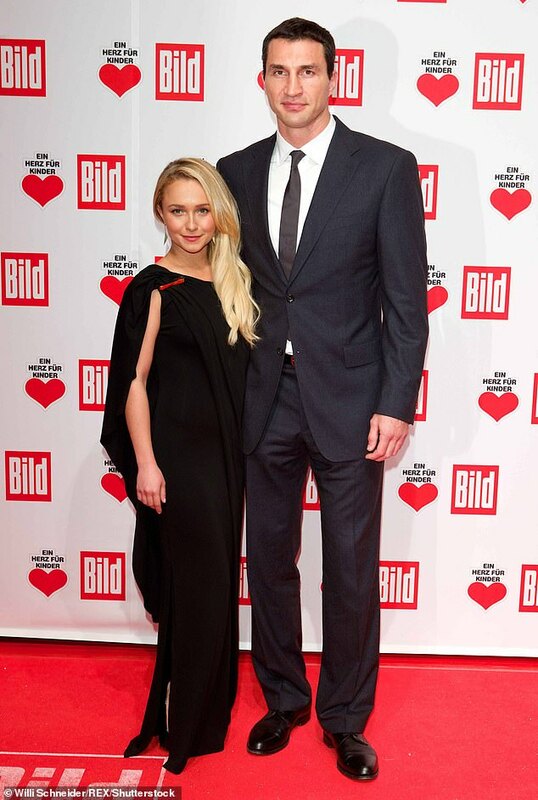 Hayden has been dating Hickerson for a few months, after splitting from former-boxer Wladimir Klitschko, with whom she has one child, Kaya. The actress's family are reportedly concerned that about her new man and her hard partying. 'They are deeply concerned,' a source close to Hayden told Radar Online earlier this month. Panettiere revealed in 2017, to GMA, that she checked into rehab after suffering postpartum depression following the birth of her daughter. Seems like she's off the rails. I knew she had postpartum and had split with the boxer, but then I saw something that he was raising the daughter in the Ukraine. Not sure if she actually lost custody, or if it's a mutual agreement or what. Weren't there some fucked up blind items supposedly about her? She's been acting since she was a kid (I still remember her from a L&O SVU episode, she was adorable) and I just feel like she has some of the sad issues of so many child actors. CornFlakegrl, DawnM74, fgg and 2 others like this. To be fair, he could've just been trying to give him some electrolytes. yanna, mostroop and Mrs P like this. A few years ago, CDAN had put out some incredibly lurid, completely unsubstantiated, blind items about her. I still don't believe them, although it sounds like she is dating someone in a really messed up family. And nobody should be walking around a bar, and into the street, in their bare feet. Trixie, DawnM74 and palta like this. Her picker is way fucked up. And nuh-uh, is the daughter really being brought up by boxer dad in Ukraine??? Raised by a nanny is more than likely what is happening. Hayden needs an intervention asap. it was pretty well known that the post partum thing was code for a drug issue and the Nashville folks were giving her once last shot at rehab - Connie Britton supposedly was at her wits end and was done if HP stayed, which may have influenced her earlier than planned exit of the last season. They had more closure to do with HPs character. The rumors about HPs upbringing and the lifestyle of her paren'ts and what they exposed her to run wider than just Enty. No idea if they are true but childhood demons is what the storyline was for her on the show and i never thought that was a coincidence. Yes I remember reading that the ex is raising the daughter and has custody of her, and Hayden just spends time with her on visits now & then. I'm afraid Hayden has some serious demons, and i hope she's able to overcome them. I was wondering what happened to her daughter and read somewhere that she's living with her dad in Ukraine. Hell I missed she got divorced. That's a serious drug problem if you give up your baby to be raised in Ukraine. Jesus. holly, pinkbunnyslippers, czb and 2 others like this. ^ wow, I had no idea the baby was living with the dad. I wonder if Hayden even put up a fight or if she was just "I can't do this, she needs to live with her father" ? I have no reason to think that the child is having anything except a very stable, loving home environment in Ukraine with her father. When Hayden was with him, they were pretty low-key. I hope & believe he is a hands-on parent. fgg, tulip, Mrs P and 3 others like this.